Make the switch to whole wheat pastry flour. You’ll be pleasantly surprised. Wow. I could bake pancakes that didn’t land like bricks when I served them up. I could bake muffins that didn’t taste like a field in Kansas. I could bake brownies with whole grain and they didn’t taste “too healthy”. I think that was when I heard angels singing. 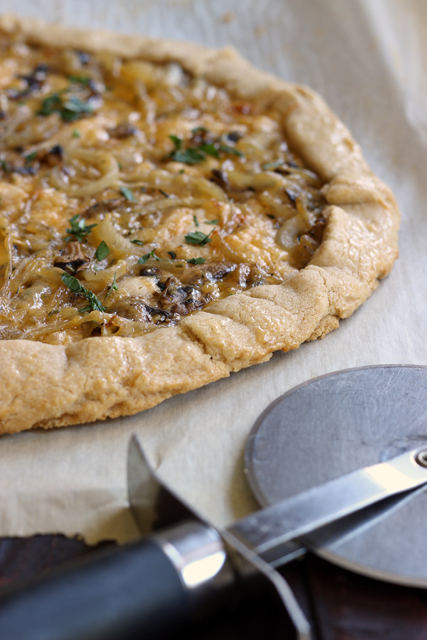 Hop on over to Bob’s Red Mill and hear my tale of tastiness and grab this recipe for a Galette with Mushrooms, Onions, and Cheddar. I can’t find the cookbook winners from December 1st. Where are they listed? Great looking crust, by the way! Will have to try this. They are now on the post. I was a little late in doing that. So sorry for the delay. How does the texture of the whole wheat pastry flour differ from white whole wheat flour? I’ve been using the white whole wheat and am able to replace all or most of the all-purpose flour with few comments from my family. It’s a finer grind, I think. Feels a little dustier, if that makes sense.